Siteline Cabinetry is sold all over the country. Regionally, the company employs independent sales and training reps to help ensure the brand flourishes in major U.S. markets. David Flagg of Flagg Sales, LLC is one such representative in the Indiana, Michigan, Ohio, Kentucky, Tennessee and Western Pennsylvania territory. David calls on authorized Siteline showroom partners, where he trains them on how to design and specify the product, as well as consults on display design and sales techniques. Recently, David and his wife Megan embarked on their personal remodeling journey, when they decided to update their vintage, 1955 kitchen which had received a minor cosmetic makeover some years back. 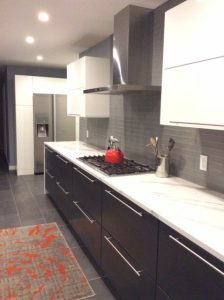 Starting with the needs assessment phase, David and Megan looked at a variety of sources for inspiration — Pinterest, design and product websites, and of course, the Siteline Cabinetry showrooms where David visits. When asked about why he selected Siteline specifically, David notes, “We chose Siteline because of the contemporary style offering and high value proposition; you get a lot for your money. There were also other details driving David and Megan toward a remodel. “We needed more efficient access to our appliances, a more logical way to store items and to increase our counter space. There were also electrical issues that were corrected,” comments David. All of these challenges were addressed in the new plan. Design details are a key part of this makeover, details such as the waterfall-style Quartz counters in Cambria Britannica. (A waterfall countertop “falls” off the edge of a set of cabinets, creating the appearance of a continuous surface that blends from the top, down the side.) Also contributing to the design aesthetic is the airy feel of negative space surrounding the vent hood, the new double ovens and a modern, stainless steel farm sink. Contrast is another design highlight in this very contemporary remodel. 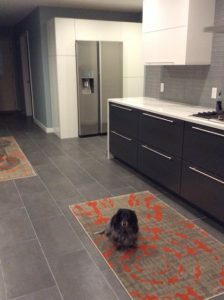 The Flaggs chose the Siteline Amici slab-style door in Porcelain Acrylic for their wall and tall cabinets, and the Fulton, slab-style door and drawer front style in dark Cadet Paint for their base cabinets. 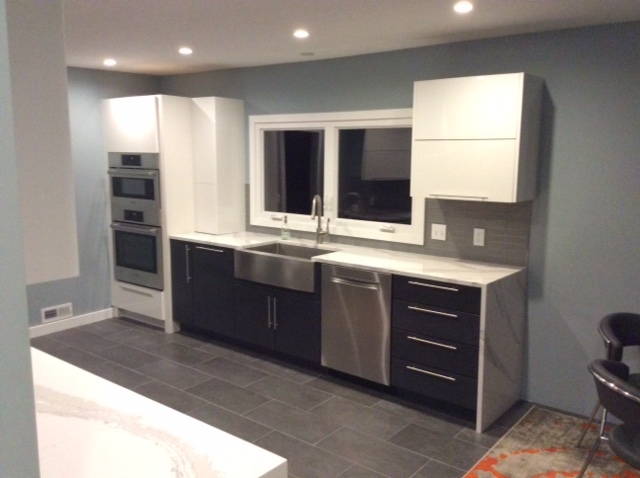 David notes,“The installers were not fans of Full Access cabinetry; however, when they completed the project, they were impressed with the quality of the cabinets as well as ease of installation. Like these looks? Click here for more Acrylic material choices. Click here for more Paint color choices.